Beacon Press: For Love of Country? After the terrorist attacks on the Pentagon and the World Trade Center, American flags appeared everywhere. Is patriotism a good response at a time of national crisis? What does it mean for us to think of ourselves as a nation first? 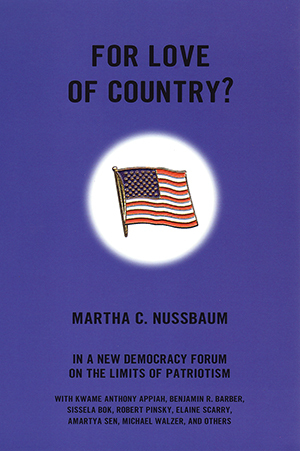 With our connections to the world growing stronger and more vital than ever, Martha C. Nussbaum argues that we should distrust conventional patriotism as parochial and instead see ourselves first of all as “citizens of the world.” Sixteen prominent writers and thinkers respond, including Benjamin R. Barber, Sissela Bok, Nathan Glazer, Robert Pinsky, Elaine Scarry, Amartya Sen, and Michael Walzer. The New Democracy Forum is a series of short paperback originals exploring creative solutions to our most urgent national concerns. The series editors (for Boston Review), Joshua Cohen and Joel Rogers, aim to foster politically engaged, intellectually honest, and morally serious debate about fundamental issues-both on and off the agenda of conventional politics.